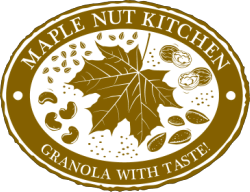 Contact Form Maple Nut Kitchen - Maple Nut Kitchen- Granola with Taste! *For wholesale inquiries, please contact our sales department at 603-903-5047! We would love to hear from you with any questions, comments, or feedback. You can either email us at info@maplenutkitchen.com, or fill out the contact form below. We will respond as soon as possible. Thanks for getting in touch!